Mike Bliss picked up the 16th last-place finish of his NASCAR Sprint Cup Series career in Sunday’s Oral-B USA 500 at the Atlanta Motor Speedway when his #37 Accell Construction Inc. Chevrolet fell out with a vibration after he completed 23 of the race’s 335 laps. The finish was Bliss’ second of the 2014 season and his first since Loudon, six races ago. With eleven races to go, he now takes sole possession of second in the battle for the 2014 LASTCAR Cup Series Championship, one finish behind leader Dave Blaney. For the Atlanta race, Bliss was tabbed to drive in place of Blaney in the #37, the part-time third entry Tommy Baldwin Racing debuted at Indianapolis in July. Last Saturday at Bristol, Blaney pulled out of the Bristol race after 37 laps, giving him the LASTCAR lead. Bliss, meanwhile, finished 17th in Bristol’s Nationwide race - his fourth-consecutive finish inside the Top 20. 44 cars showed up to attempt to qualify, but by one position in Owners Points, Bliss’ ride outranked the #77 Randy Humphrey Racing team, which for the first time had Joe Nemechek behind the wheel. Bliss timed in 33rd in the opening practice, then improved in qualifying with the 28th-fastest time at a speed of 187.481 mph. Nemechek, meanwhile, squeezed into the Top 36 by securing the 34th spot, leaving Michael McDowell and the Leavine Family Racing #95 with its first DNQ since Richmond in April. Bliss was 40th-fastest in Saturday’s first practice, and was the ony driver to not participate in Happy Hour later that day. He then participated in the night’s Nationwide event for TriStar Motorsports, extending his top-twenty streak with another 17th-place finish. In Sunday’s race, Bliss’ teammate Reed Sorenson started last in a flat black #36 Chevrolet. Bliss took 43rd on Lap 2, then was passed by Nemechek on Lap 9. On Lap 17, Nemechek was the first to lose a lap to race leader Kevin Harvick. But just six laps later, Bliss was the first car to pull behind the wall, securing him the last-place finish. For the rest of the race, the remainder of the Bottom Five changed several times until four separate incidents made them the only other retirees of the night. Finishing 42nd was Marcos Ambrose, who was running mid-pack when the engine on his #9 Stanley Tools / DeWalt Ford let go on the backstretch on Lap 125. In 41st was Tony Stewart, making his first Cup start since his tragic sprint car accident on August 9th. Stewart started 12th and contended early, only to hit the wall twice. The second incident on Lap 173 tore up the right-front fender, ending his night. 40th spot went to A.J. Allmendinger, whose right-rear tire on his #47 Hungry Jack Chevrolet shredded in the opening stages, leaving debris that was picked up on the nose of Jimmie Johnson’s #48. Allmendinger spent several laps behind the wall, then briefly returned before finally falling out in the closing stages. 39th-place Brad Keselowski started on the outside-pole and was running 3rd with just 27 laps to go when he was wrecked in Turn 4 during a sequence of green-flag stops. Keselowski didn’t fall to 39th until five laps to go as Clint Bowyer’s gearbox problem cost him eleven laps in the garage. *This is the first last-place finish for the #37 in a Cup race at Atlanta since October 30, 2005, when Mike Skinner’s BoSPOKER.net Dodge was involved in a crash after he completed 5 laps of the Bass Pro Shops MBNA 500. *This is the first time two different drivers finished last for the same team in consecutive Cup races since August 2012, when the late Jason Leffler lost fuel pressure on the #19 Humphrey Smith Racing Ford at Michigan, then Mike Bliss climbed aboard Humphrey’s #19 Toyota that lost power steering after 6 laps at Bristol. *Bliss is the first Cup driver in 2014 to finish last with “vibration” as the official cause. Jeff Green picked up the 58th last-place finish of his NASCAR Nationwide Series career in Saturday’s Great Clips 300 to benefit Feed the Children at the Atlanta Motor Speedway when his #10 Heroes Behind the Camo / SupportMilitary.org Toyota fell out with a vibration after he completed 3 of the race’s 195 laps. The finish was Green’s fifth of the season and his second in a row. With nine races to go, he trails teammate Blake Koch by two finishes, and is very much in contention for his fourth-consecutive LASTCAR Nationwide Series title. While 41 cars were on the weekend’s preliminary entry list, the #13 Headrush / OCR Gaz Bar Dodge to be run by Carl Long was withdrawn, allowing Long to run the #46 The Motorsports Group Chevrolet in place of Matt DiBenedetto, who took a turn in the team’s primary #40. Guaranteed a starting spot in the field, Green did not participate in the opening practice, ran 33rd-fastest in Happy Hour, then climbed to 30th in qualifying with an average speed of 173.039 mph. In the race itself, Green edged Long for last place by a single lap, both leaving the race in the opening green-flag run. Finishing 38th, fifteen laps behind the pair, was John Jackson, back in the #72 James Carter Attorney / CrashClaimsR.Us Chevrolet after the team’s withdrawal last week at Bristol. Series veteran Carlos Contreras came home 37th for Rick Ware in the #23 RaceTrac Chevrolet, which was sent to the back before the start for unapproved adjustments. Rounding out the Bottom Five in 36th was Kevin Swindell in his fourth start of the year driving JGL Racing’s #93 Dodge. *This is Green’s first Nationwide Series last-place finish at Atlanta since September 4, 2010, when his #36 TriStar Motorsports Chevrolet lost the transmission after 1 lap of the Great Clips 300. *This is the first last-place finish for the #10 in a Nationwide Series race at Atlanta. Caleb Roark picked up the 2nd last-place finish of his NASCAR Camping World Truck Series career in Sunday’s Chevrolet Silverado 250 at Canadian Tire Motorsport Park when his #0 Grimes Irigation & Construction RAM fell out with a broken clutch before he completed any of the race’s 64 laps. The finish was Roark’s second of the 2014 season and his first since Michigan, two races ago. With eight races to go, Roark is now tied with Ryan Ellis and Justin Jennings for the most last-place finishes this season. 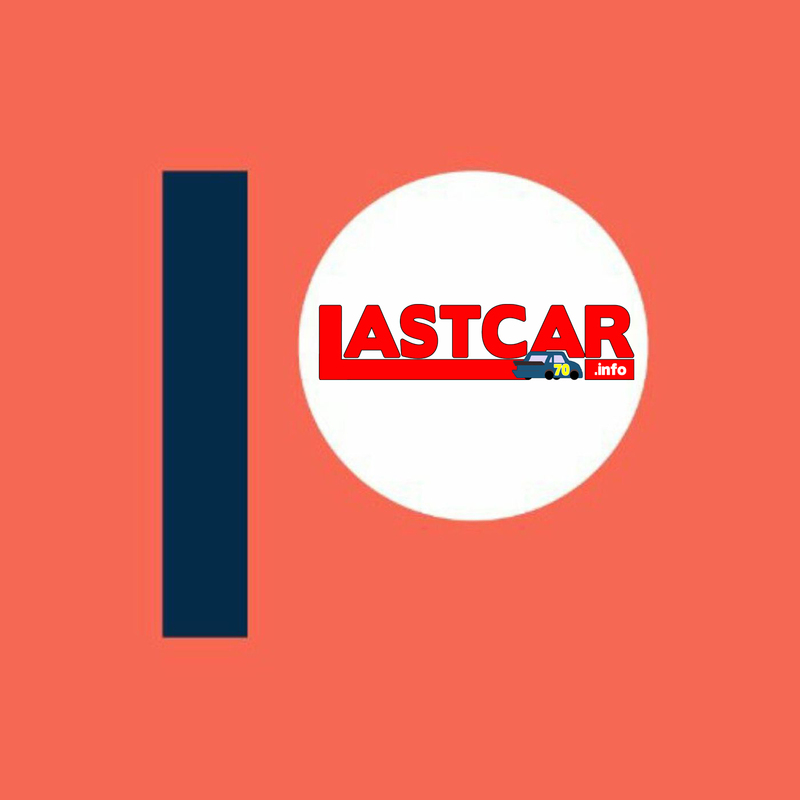 Jennings leads Roark in the 2014 LASTCAR Championship by a single bottom-ten finish (as both have five Bottom Fives). Just 29 trucks were slated to attempt the second-annual race at the sprawling Canadian road course. 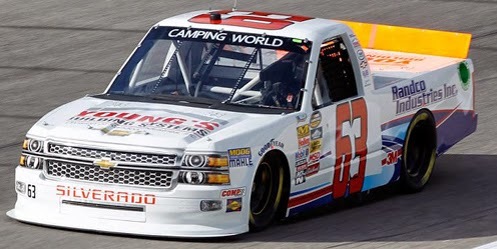 However, the number was trimmed to 28 in the aftermath of some discord within the Turner-Scott Motorsports team, who withdrew one of their three trucks - the #30 Rheem Chevrolet of former series champion Ron Hornaday. For the first time since Eldora, both of Jennifer Jo Cobb’s entries for the weekend were RAM trucks. Cobb ran the team’s familiar green #10 while Roark drove a flat black #0. Roark did not participate in the opening practice session, then helped Cobb practice the #10 in Happy Hour, turning in the slowest time overall. Roark still managed to qualify his #0, which ended up at the back of the field with a speed of 71.713 mph - 43 seconds slower than pole winner Alex Tagliani’s lap of 109.889 mph. Whatever struggles Roark faced during the weekend may have contributed to his early exit from Sunday’s race. His truck pulled off the track without completing a single lap. Finishing 27th, eight laps ahead of Roark, was B.J. McLeod, who mid-week was named the driver of Bobby Dotter’s unsponsored #08 Chevrolet. In 26th was Justin Jennings, whose ride in the black #36 Mittler Bros. / LG Seeds / Ski Soda Chevrolet was highlighted by a Lap 17 spin in Turn 5 that nearly collected Cole Custer and Erik Jones. Jennings’ teammate Scott Stenzel in the #63 remained in the Bottom Five for mechanical issues, but returned to the track to finish 24th. Between Jennings and Stenzel was 25th-place John Hunter Nemechek, who fought electrical issues as early as Lap 19 before bringing out the first caution on Lap 47 for stalling entering the first corner. He retired from the race with transmission issues as the official cause. *Jennifer Jo Cobb’s #0 team has now finished last in both Truck Series races at Canadian Tire Motorsports Park. Last year, Chris Lafferty broke the clutch after 3 laps, scoring the third of six last-place finishes that season on his way to the LASTCAR Truck Series Championship. Dave Blaney picked up the 24th last-place finish of his NASCAR Sprint Cup Series career in Saturday’s IRWIN Tools Night Race at the Bristol Motor Speedway when his #37 Accell Construction Inc. Chevrolet fell out with overheating problems after he completed 37 of the race’s 500 laps. The finish was Blaney’s third of the 2014 season and his first since June at Pocono, ten races ago. 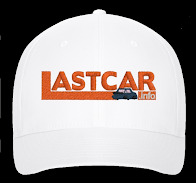 Blaney, the 2009 LASTCAR Champion, remains the only driver to finish last more than once this season, and in so doing extends his lead to two finishes over the field with twelve races to go. Following Blaney’s most recent last-place run, the #77 Ford fielded by Randy Humphrey Racing suspended operations to reorganize, and planned to return to the series at Indianapolis. However, when the #77's hiatus continued past Indy, Blaney reunited with Tommy Baldwin, for whom Blaney qualified in three consecutive Daytona 500s. Blaney drove the #37, a third team Baldwin debuted at Indianapolis with Bobby Labonte, and finished 26th at Pocono, then 33rd at Michigan. In between those races, Humphrey’s team returned at Watkins Glen with Nelson Piquet, Jr. behind the wheel. Blaney and the #37 returned at Bristol, where 43 drivers showed up for as many spots. In Friday’s opening practice, he turned in the 30th-fastest time, skipped Happy Hour, and put up the 35th-fastest time in qualifying with a speed of 127.081 mph. In the race itself, Blaney fell to the back and around Lap 10, was the first driver to lose a lap. 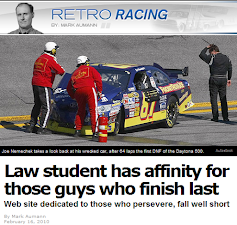 He was then unseated by Brett Moffitt, back in the #66 Identity Ventures Racing entry that was originally slated to be driven by Joe Nemechek. Moffitt lost four laps due to an unscheduled stop after making contact with Aric Almirola. By Lap 36, however, Blaney had gone to the garage area, done for the night. Moffitt, who damaged the front valence of his Toyota after rear-ending J.J. Yeley, lost the engine forty laps later and ended up 42nd. Finishing 41st was Almirola, whose STP Ford was involved in a hard crash on Lap 126 when a spinning Brian Vickers turned him into the inside wall. The next wreck on Lap 162 filled out the Bottom Five when a spinning Denny Hamlin slid directly into the path of Dale Earnhardt, Jr., ripping off the driver’s side sheet metal of Earnhardt’s #88. Earnhardt returned to the track on Lap 284, 106 laps in arrears, with duct-tape numbers on the driver’s door. He only completed one lap before pulling out once more, ending his night. *This is Blaney’s first last-place finish in a Cup race at Bristol since August 22, 2009, when his #66 PRISM Motorsports Toyota started 4th, scraped the wall early, then fell out after 8 laps of the Sharpie 500. Blaney swept both last-place finishes that season on his way to the LASTCAR title. *This is the first last-place finish for the #37 in a Cup race at Bristol since August 28, 2004, when Kevin Lepage and his Carter’s Royal Dispos-All Dodge fell out with a vibration after he completed 11 laps. *This is the first time a Cup driver finished last at Bristol due to overheating issues since March 25, 2001, when Joe Nemechek’s #33 Oakwood Homes Chevrolet fell out after 108 laps of the Food City 500. Jeff Green picked up the 57th last-place finish of his NASCAR Nationwide Series career in Friday’s Food City 300 at the Bristol Motor Speedway when his #91 Heroes Behind the Camo / SupportMilitary.org Toyota fell out with a vibration afer he completed 3 of the race’s 300 laps. eleventh for TriStar Motorsports this season. With ten races to go, the all-time LASTCAR leader now trails teammate Blake Koch by three finishes. It is the 200th last-place finish by Toyota across all three of NASCAR’s top divisions. 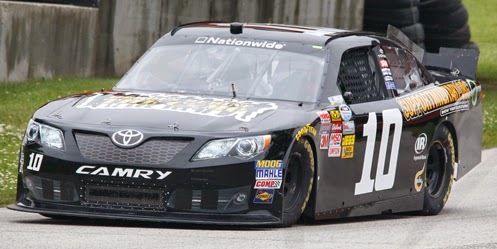 Since Fontana, Green has made ten of the eighteen races with a season-best 18th at Dover in one of three starts driving in relief of teammate Eric McClure in TriStar’s #14 Hefty Ultimate / Reynolds Wrap Toyota. His other starts came in TriStar’s “start-and-park” entries, #10 and #91, he has shared with Blake Koch. Bristol would be Green’s 385th Nationwide start and the first for the #91 since Green’s 38th-place run at Talladega in May. As of Tuesday, he was one of 46 entries for the race - the biggest entry list since 45 showed up at Daytona in July. John Jackson had been added as the 45th entry, but withdrew by Thursday. The remaining 45 waged battle for the remaining 40 spots. Green was the only driver to not participate in the opening practice session, then jumped to 35th in Happy Hour, besting seven “go-or-go-homers.” In qualifying, he improved further, jumping to 29th with an average speed of 120.588 mph. Among the five DNQs were LASTCAR Truck Series co-leader Ryan Ellis in Vision Racing’s #37, Iowa last-placer Matt Frahm in The Motorsports Group’s #46, and Milka Duno, who was attempting her first NASCAR start with RAB Racing. The first 42 laps of Friday’s race were run under the green flag, with Green leading two other drivers to the garage during that stretch. Green beat Morgan Shepherd by thirteen laps in what was Shepherd’s first start since Iowa, and one lap afer came Kevin Lepage in Mike Harmon’s unsponsored #74 Dodge. Finishing 37th was Chad Boat, whose #84 Billy Boat Performance Exhaust / CorvetteParts.net Chevrolet was wrecked in a three-car accident on Lap 112. Rounding out the Bottom Five was Tanner Berryhill in the Vision Racing team car to Ellis’ #37, after Berryhill’s #17 NationalCashLenders.com Dodge was damaged in the Boat wreck. *This is Green’s first last-place finish in a Nationwide Series race at Bristol since this race in 2011, when a vibration after 4 laps left him with his record-setting fourth consecutive last-place finish while driving TriStar’s #44 Chevrolet. 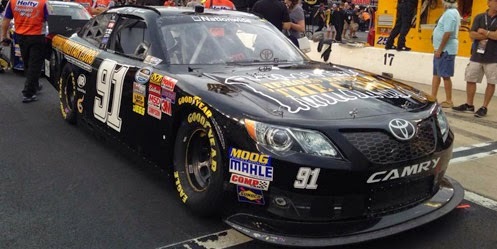 *This is the first last-place finish by the #91 in a Nationwide race at Bristol since this race in 2008, when Justin Hobgood’s MSRP Motorsports Chevrolet had ignition problems after he completed just one lap. Bryan Dauzat picked up the 1st last-place finish of his NASCAR Camping World Truck Series career in Thursday’s UNOH 200 Presented by ZLOOP at the Bristol Motor Speedway when his #28 O.B. 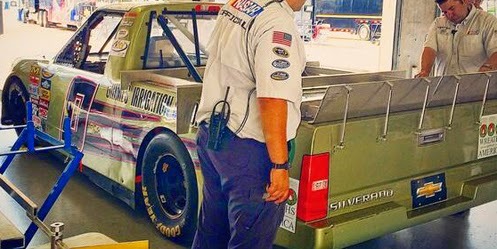 Builders Door & Trim / FDNY Racing Chevrolet fell out with suspension trouble after he completed 4 of the race’s 200 laps. Though making his Truck debut, the 54-year-old driver from Alexandria, Lousiana is by no means a stranger to NASCAR. Since 2008, he’s made 49 combined starts in the Whelen Modified Tour and Whelen Southern Modified Tour. The Southern division saw both his best career finish of 5th at Bowman-Gray Stadium in 2009 and his best points ranking of 11th just ast year. He’s competed as an owner-driver in each of those starts, carrying sponsorship from O.B. Builders on his #97. This year, Dauzat and O.B. made the move to stock cars with a 26th-place finish in the ARCA race at Talladega this past May. For his NASCAR debut, Dauzat looked to the trucks and the #28 fielded by Jim Rosenblum. Rosenblum, a part-time Cup and Truck Series owner since 1983, started the year with Ryan Ellis, who finished 18th in the opener at Daytona - the team’s best finish since 2008. Following a crash at Charlotte, Rosenblum and his FDNY Racing team looked to rebuild their truck while Ellis drove for other teams, moving into a tie for the LASTCAR lead in Jennifer Jo Cobb’s #0. Rosenblum and Ellis reunited at Pocono earlier this month, finishing 19th. At Bristol, Dauzat drove in place of Ellis, whose ride in the #0 withdrew before qualifying, leaving 37 entries for 36 spots. 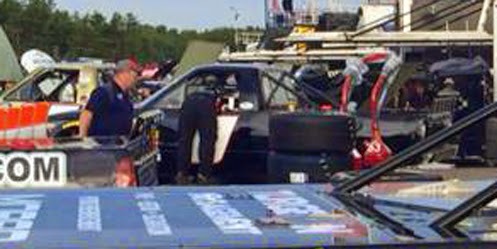 Dauzat’s week began on Wednesday afternoon, where he finished 9th in his division (18th overall) during the 39-car combination race for the modified series. He trailed the only practice session, but managed to beat Eldora last-placer Mike Affarano in qualifying, bumping Affarano out of the field. Dauzat timed in 36th with an average speed of 111.955 mph, edging Affarano by less than three tenths. At the start of the race, delayed by rain from Wednesday night to Thursday morning, Dauzat exited the race after 4 laps, followed one lap after by LASTCAR Nationwide Series leader Blake Koch, giving Mike Mittler’s #36 RAM its first start since Gateway. Finishing 34th was B.J. McLeod in Bobby Dotter’s ThunderExhaust.com Chevrolet, followed by Jake Crum and Bryan Silas, who both backed into the Turn 2 wall after 14 laps. *This is the first last-place finish for the #28 in a Truck Series race since February 26, 2000, when Kenny Allen’s Chevrolet broke a transmission after 19 laps of the Florida Dodge Dealers 400K at the Homestead-Miami Speedway. Allen was also driving for owner Jim Rosenblum in an unsponsored truck. It was Allen’s only start for the team and the last of his career. *The #28 had never before finished last in a Truck Series race at Bristol. Kyle Larson picked up the 1st last-place finish of his NASCAR Sprint Cup Series career in Sunday’s Pure Michigan 400 at the Michigan International Speedway when his #42 Target Chevrolet was involved in a hard single-car crash that ended his race after he completed 94 of 200 laps. The finish came in Larson’s twenty-seventh series start. Larson, who just turned 21 last month, has enjoyed a spectacular rise through the racing ranks. In less than three years, the native of Elk Grove, California has gone from finishing 10th in his first Truck Series start at Kentucky in 2012 to leading this year’s battle for Cup Series Rookie of the Year. He’s scored five top-five finishes and ten top-tens in Cup in 2014, scored his first pole at Pocono and earned a career-best 2nd to Kyle Busch at Fontana. Larson came to Michigan 10th in points after a 4th-place finish at Watkins Glen, a run that moved him into the third of four spots for winless drivers to transfer into the 2014 Chase for the Sprint Cup. With an 8th-place run at Michigan in June on top of his weekend at Fontana, hopes were high for another strong finish. Larson was 17th-fastest in the opening practice session, then narrowly missed transferring into the final round of qualifying. His lap of 204.082 mph was still good enough to put him 13th on the starting grid, and he improved to 7th in the second practice and 2nd to polesitter and eventual race winner Jeff Gordon in Happy Hour. Sunday’s race featured a surprising amount of changes in the Bottom Five as several contenders faced early problems. Sonoma last-place finisher Landon Cassill started 43rd in Hillman Racing’s #40, one of four drivers sent to the back before the start for driver and mechanical changes. This included J.J. Yeley, driving in relief of rookie Ryan Truex, who suffered a concussion in a scary practice accident exiting Turn 2 on Saturday morning. On Lap 2, Joe Nemechek took the 43rd spot from Cassill, then both were passed by Kyle Busch, who tagged the wall in Turn 4, then hit it again in Turn 2, bringing out the first caution of the day. With track-record-breaking speeds all weekend adding to the severity of the hit, Busch’s car required 25 laps of repairs in the garage area. No sooner did Busch return to the track when a multi-car accident on Lap 26 sent four more back in his place - Justin Allgaier, Matt Kenseth, Martin Truex, Jr., and Trevor Bayne. Truex returned to the track first, eight laps down, shuffling Allgaier, Kenseth, and Bayne to 40th through 42nd. Busch passed Bayne on Lap 50, dropping Bayne to last, and Kenseth returned to the track on Lap 52, moving him past Allgaier. Now in 43rd, Bayne seemed on his way for his second last-place finish in four races, but he too returned on Lap 69, dropping Allgaier to last on Lap 71. Seven laps later, Jeff Burton, driving in relief of Tony Stewart, went to the garage for smoke in the cockpit, and also seemed done for the day. However, with so many cars multiple laps down, Burton was still not in the Bottom Five when the caution flew on Lap 98. By that lap, Larson’s promising start to the weekend had taken a frustrating turn. During the competition caution on Lap 22, Larson collided with Dale Earnhardt, Jr. while leaving pit road, tearing up the left-front fender of Larson’s car. This required a second stop that left him 42nd when the Lap 26 wreck occurred in the middle of the pack. While Larson avoided that accident, his car’s aerodynamics were compromised, leaving him toward the back of the pack. Then, on Lap 98, Larson lost a right-front tire, sending him hard into the outside wall in Turn 4. 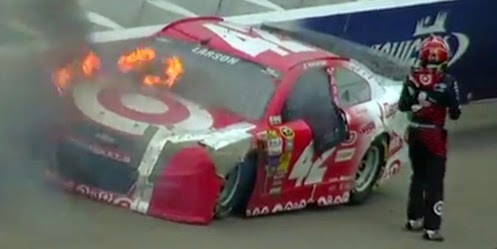 Uninjured, but with his car on fire, Larson climbed out - the first driver to do so under NASCAR’s new post-crash regulations instituted in response to the death of Kevin Ward, Jr.
Larson was the first car out of the race, but it still appeared that Allgaier would remain in 43rd with Burton’s smoking car eventually joining him in 42nd. However, Allgaier returned to the track during Larson’s caution on Lap 100, his #51 now 73 laps down. Burton returned to the race around the same time, meaning that six cars behind Larson were all 24 or more laps down with less than 100 to go. One final contender joined in when Michael Annett, damaged in the multi-car crash, spent several laps in the garage repairing his #7 Chevrolet. However, when he returned to the race, Larson fell to the rear unopposed. He took 42nd on Lap 139, then 43rd on Lap 170. Allgaier, Bayne, Annett, and Kyle Busch rounded out the Bottom Five with Kenseth, Burton, and Truex each ten-plus laps ahead of the group. Larson’s last-place finish has dropped him to 14th in points. With three races to go before the cutoff to the Chase, he now must either win his way in or pass at least three of the six winless drivers now ranked ahead of him in points: Matt Kenseth, Ryan Newman, Clint Bowyer, Greg Biffle, Kasey Kahne, and Austin Dillon. *This is the first last-place finish for the #42 in a Cup Series race since November 2, 2008, when Juan Pablo Montoya’s Texaco / Havoline Dodge was involved in a crash that ended his run in the Dickies 500 at Texas. Montoya also scored the number’s most recent last-place finish at Michigan, which took place one week before his first Cup Series win at Sonoma in 2007. *This marks the first time that three driver scored their first last-place finishes in their respective NASCAR divisions on the same weekend since September 21-23, 2012: Blake Koch (Trucks at Kentucky), Charles Lewandoski (Nationwide at Kentucky), and Kelly Bires (Cup at New Hampshire). 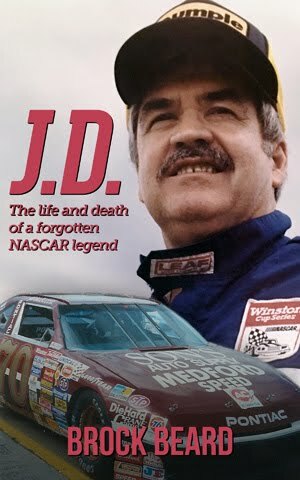 *This also marks the first time that three drivers scored their first-ever last-place finishes in any of NASCAR’s top three divisions on the same weekend since February 13-15, 2009: Landon Cassill (Trucks at Daytona), Chrissy Wallace (Nationwide at Daytona), and Joey Logano (Cup at Daytona 500). 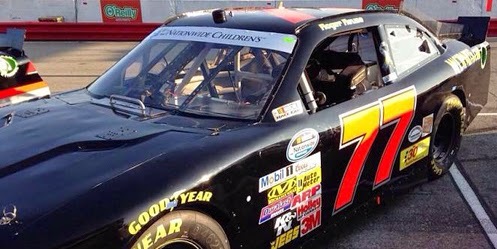 Roger Reuse picked up the 1st last-place finish of his NASCAR Nationwide Series career in Saturday’s Nationwide Children’s Hospital 200 at the Mid-Ohio Sports Car Course when his #77 DubZ Thermal Products / wciparts.com Dodge fell out with transmission problems after he completed 3 of the race’s 90 laps. The finish came in Reuse’s second series start. This season, the 47-year-old Roger and his younger brother Bobby were selected to drive the road courses for owner-driver Mike Harmon in 2014. Bobby made his NASCAR debut at Road America in June, finishing 29th in Harmon’s #74. Roger’s came next when he climbed into the same car last week at Watkins Glen and came home 30th. While technically “road course ringers,” the Reuse brothers are actually accomplished short track racers from Alabama. According to The Third Turn, Bobby has competed in at least four different divisions since 2009, and big brother Roger’s career goes back even further. Roger cut his teeth at his home track, the Birmingham International Raceway, finishing 5th in the Pure Stock division in 1984. From 1986 through 1991, he competed in five seasons in the NASCAR Goody’s Dash Series, finishing a career-best 9th in points his final season. Since then, he’s competed in everything from late models to the 2007 Snowball Derby, where he finished 23rd. Just last year, he made three starts in the Southern Super Series and one in the Sunoco Gulf Coast Championship Series, the latter a series Chase Elliott won in 2010. Last Sunday was the second-consecutive road course race on the Nationwide Series calendar. With just 37 cars on the preliminary entry list, two post-entries were added using the backup cars of two single-car teams. John Jackson climbed aboard the #79, the Jimmy Means Racing backup for full-time driver Joey Gase. Mike Harmon followed suit by entering both Reuse brothers. With Bobby already slated to drive the #74, Harmon changed the numbers on his backup Dodge to #77, putting Roger in that car. Roger did not participate in the opening practice session on Friday, then completed just one lap at reduced speed in Happy Hour. He also put up the slowest speed in qualifying with a lap of 76.267 mph, nearly 20 mph slower than polesitter Sam Hornish, Jr.’s lap of 95.873 mph. At the start of the race, John Jackson briefly held the 39th spot before Reuse took it back on Lap 2, then pulled off the track two laps later. The first caution fell seconds later for Jeffery Earnhardt, whose #4 Bandit Chippers Chevrolet lost the brakes in Turn 4 and narrowly avoided a hard hit into the tires. Earnhardt held the 38th spot for much of the race, but returned to finish the race 18 laps down. He came home 28th, passing the rest of the Bottom Five in the process. 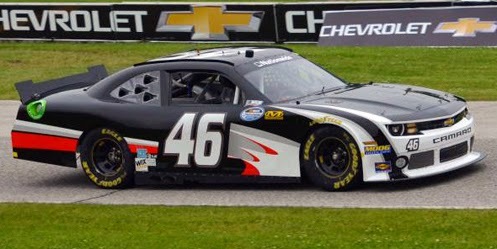 Finishing 38th was Josh Reaume, the road course driver of The Motorsports Group’s #46, who fell out four laps after Reuse. Finishing 37th was Timmy Hill, making his first Nationwide start since Dover in May, driving the #55 Hopek Hardware Plus / Engine Parts Plus Chevrolet. 36th went to Carl Long, his first start since Iowa and third of the year for Rick Ware. Rounding out the Bottom Five was Blake Koch, whose run in TriStar’s #10 Toyota ended after 12 laps. Jeff Green, still four finishes behind Koch in the 2014 LASTCAR Nationwide Series rankings, made his third start of the year filling in for Eric McClure in the #14 Reynolds Wrap / Hefty Ultimate Toyota. Green ran in the Top 5 briefly during a round of pit stops, but crashed out after 70 laps, leaving him 29th. *This is the first last-place finish for the #77 in a Nationwide race since November 17, 2007, when Bobby Labonte’s Dollar General Chevrolet was involved in a crash that ended his run in the Ford 300 at Homestead after 4 laps. Caleb Roark picked up the 1st last-place finish of his NASCAR Camping World Truck Series career in Saturday’s Careers For Veterans 200 at the Michigan International Speedway when his #0 Grimes Irrigation & Construction Chevrolet broke the rear gear after he completed 2 of the race’s 100 laps. The finish came in Roark’s ninth series start. 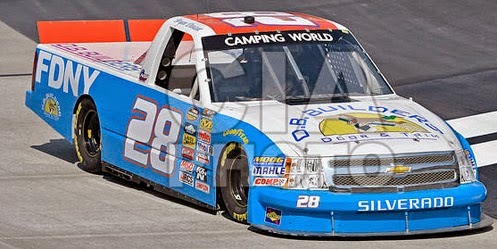 The 21-year-old short tracker from Abingdon, Virginia made his Truck Series debut driving for Ken Smith at Martinsville on April 2, 2011. Roark finished 19th that day, which is still his career best. After running part-time for Smith for the next two seasons, Roark moved to Jennifer Jo Cobb’s team to share the #0 Chevrolet with Ryan Ellis and Willie Allen. He’s also made his Nationwide debut, finishing 32nd at Iowa in May driving Bobby Dotter’s #55. Michigan saw just 28 trucks on the preliminary entry list. The short field grew by one more after the post-entry by Adam Edwards, driving Norm Benning’s old #57 Chevrolet while Benning remained in his #6. Roark bested Edwards in the opening pracitce with the 27th-fastest time and did not participate in the final practice session. He secured the 27th starting spot with an average speed of 161.146 mph. In the race itself, Roark pulled behind the wall under green, followed a lap later by Edwards. One lap behind them was Todd Peck, making his third start of the season and his first in Bobby Dotter’s #07 ThunderExhaust.com Chevrolet. Travis Kvapil qualified 6th as the relief driver for John Wes Townley, but lost the engine on his #05 Zaxby’s Toyota after just even laps, bringing out the only caution of the race. Rounding out the Bottom Fie was T.J. Bell, whose #50 Drivin’ For Linemen / KnowledgeVine Chevrolet broke an oil line. *This is the first last-place finish for the #0 in a Truck Series race at Michigan since 2012, when T.J. Bell’s transmission gave out on his Driven2Honor.org Ford after one lap of the VFW 200. Cole Whitt picked up the 1st last-place finish of his NASCAR Sprint Cup Series career in Sunday’s Cheez-It 355 at the Glen at Watkins Glen International when his #26 Bully Hill Vineyards Toyota was involved in a hard single-car crash after he completed 9 of the race’s 90 laps. The finish came in Whitt’s 36th career start. The 23-year-old native of Alpine, California is competing in his first full Cup Series season. He climbed quickly from a full season in the K&N East Series in 2010, one in Trucks in 2011, and one in Nationwide in 2012, finishing top-ten in points each year. Whitt made his Cup debut at Phoenix in the fall of 2011, looking to drive for Team Red Bull. However, when the team collapsed, Whitt ran on a part-time basis for Stacy Compton and Joe Falk in 2012 before joining Swan Racing in late 2013. A single-car effort at the time, Swan Racing had grown steadily from its roots as the start-up Inception Motorsports in 2011. Veteran driver David Stremme helped transition the team into a full-season effort, following a transition from Chevrolet to Toyota and ownership to Brandon Davis. However, at the start of the 2013 Chase, Stremme was released so Whitt could share the ride with Kevin Swindell and Parker Kligerman. 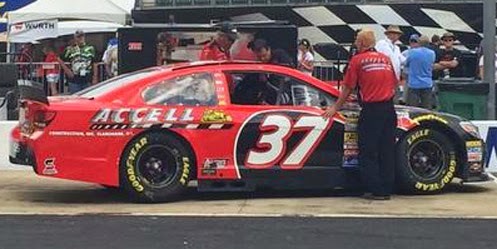 Whitt’s best finish of 27th at Dover fell short of Kligerman’s best of 18th at Texas, but both were signed for the team’s expansion to two cars in 2014 - Kligerman in the #30 and Whitt in the new #26. Unfortunately, a combination of sponsorship troubles and a series of costly crashes forced Swan Racing to shut down heading into Richmond, leaving Kligerman without a ride. 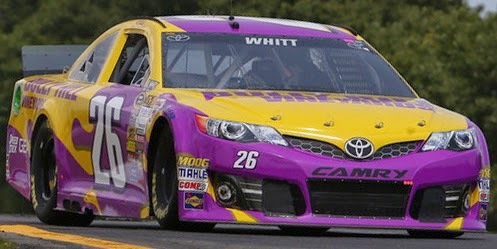 Whitt’s #26 was absorbed by the two-car team BK Racing, a team itself formed from the shutdown of Team Red Bull. To date, Whitt has yet to improve on his career-best finish of 18th in Swan’s car at Fontana earlier this year. However, he had failed to finish just two Cup races in 2014 - both due to late-race crashes at Daytona. Since the Swan-BK merger, Whitt’s car has run nine different primary sponsors. For Watkins Glen, he carried the bright gold and purple shades of local restaurant Bully Hill Vineyards, a fixture at The Glen since road course specialist Ron Fellows carried the colors in the late 1990s and early 2000s. Whitt turned in the 35th-fastest speed in Friday’s first practice, improved to 26th in Happy Hour at the end of his last run, then jumped to 18th in qualifying with a lap of 127.715 mph. The lap made Whitt the second-fastest rookie in the field, trailing only 15th-place Justin Allgiaer, and was his best Cup start since his career-best 17th at Daytona last month. In the race itself, the 43rd spot on the grid belonged to Danica Patrick, who was having a particularly frustrating weekend. In the opening practice, Patrick lost the engine, forcing her to start in the back regardless of her timed run. Then, with less than three minutes left in Happy Hour, she cut a tire and slammed the Turn 9 wall, sending her to a backup which was the slowest car in qualifying. By the chicane on the first lap, however, she had passed a handful of cars along with Regan Smith, the last-minute replacement of the #14 Stewart-Haas Racing entry following Stewart’s withdrawal after the tragic accident of the night before. Slipping to 43rd after the moves by Patrick and Smith was Joe Nemechek, making his first Cup start at Watkins Glen in two years. Then on Lap 4, Nemechek and his #66 Land Castle Title Toyota suddenly found themselves ahead of Kevin Harvick, forced to pit on Lap 4 for bean bags the crew mistakenly left in his #4 after pre-race inspection. Justin Allgaier pitted with Harvick, putting the two in the final two spots. The first car to lose a lap, however, was Paul Menard, who on Lap 5 went behind the wall after a lengthy stop for an early brake issue. Menard’s crew was just finishing repairs when the first caution of the afternoon fell on Lap 10. Whitt, running 19th at the time, suffered either a brake or throttle failure (or the combination of both) and completely missed the first corner. His #26 shot off the track, then plowed head-on into the tire barrier separating the track from the grandstands. Whitt climbed out unhurt, but his half-buried Toyota was done for the afternoon. Menard returned to the track under the caution, dropping Whitt to last by the restart. The remainder of the race was a slugfest, featuring several changes in the Bottom Five. First Kyle Busch, then Jeff Gordon and Brad Keselowski spent time behind the wall, but all three returned to the track. Busch suffered the biggest setback of the three. Frustrated by a pit miscue for taking his gas can out of his stall, he banged doors with Martin Truex, Jr. in Turn 9, forcing more than twenty laps of repairs. When Busch returned to the race in 42nd, a frightening crash on Lap 56 between Ryan Newman and Michael McDowell forced a nearly 90-minute red flag. Busch managed to pass Newman and McDowell, but not Ryan Truex, whose #83 Burger King Toyota suffered a suspension failure in the closing laps. *This is the first last-place finish for the #26 in a Cup race since October 7, 2012, when Josh Wise’s MDS Transport Ford overheated after 5 laps of the Good Sam Roadside Assistance 500 at Talladega. It is the first last-place finish for the #26 in a Cup race at Watkins Glen since 1995, when Hut Stricklin’s Quaker State Ford broke a valve after 20 laps. *This is the second-straight last-place finish for BK Racing at Watkins Glen. Last year, David Reutimann’s #83 Burger King Toyota lost the engine after four laps. Josh Wise picked up the 3rd last-place finish of his NASCAR Nationwide Series career in Saturday’s Zippo 200 at the Glen at Watkins Glen International when his unsponsored #46 The Motorsports Group (TMG) Chevrolet fell out with brake problems after he completed 3 of the race’s 82 laps. The finish is Wise’s first of the 2014 season and his first in the series since last August at Bristol, thirty-one races ago. He is the fourth different driver to finish last in TMG’s #46 this season, a team which has scored five last-place runs in 2014. The team still trails TriStar Motorsports’ #10 Toyota by three finishes. Wise’s Nationwide effort complements his first full Cup season with Phil Parsons Racing. Driving the #98 Chevrolets and Fords, Wise has made every race except Phoenix, thanks in part to the grassroots Dogecoin effort started at Reddit. His best finish of the season was a 20th in the first Dogecoin race at Talladega, and he has just one DNF - a mid-race crash during the Coca-Cola 600. One week before the crash, Wise earned the Sprint Fan Vote that allowed him to transfer into his first-ever start in the All-Star Race. Watkins Glen was Wise’s first Nationwide start of the year driving the #46. This gave teammate Matt DiBenedetto a chance to drive TMG’s primary #40 for the fifth time this season. Wise’s best finish in sixteen previous starts this year came at Darlington, where he finished 15th. In five other starts, however, mechanical troubles ended his race, including three engine failures at Fontana, Talladega, and Dover. 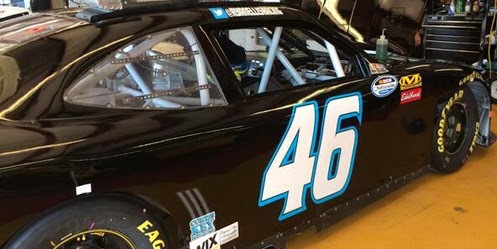 With TMG continuing to search for sponsorship, it was now Wise’s duty to park the #46. Wise and DiBenedetto were among 41 drivers on the preliminary entry list for Saturday’s race. However, by Friday, the number was cut to 39 following the withdrawals of Morgan Shepherd in his #89 and a third JGL Racing entry, #24, to be driven by road course instructor Chris Cook. After not practicing in the first session, Wise put up the 35th-fastest time in Happy Hour, then on Saturday qualified 35th with an average speed of 116.060 mph. Three laps into the race, Wise pulled off the track, followed three green-flag laps later by Blake Koch in TriStar’s #10. Finishing 37th was road course ringer Kevin O’Connell, the 3rd-place finisher of the Nationwide event at Road America in June, whose #23 50 Campfires Chevrolet was wrecked by Trevor Bayne entering the Inner Loop. As of this writing, reports indicate O’Connell does not yet have sponsorship for next week’s race at Mid-Ohio. Joey Gase was four laps down when his Jimmy Means Racing #52 Donate Life / Finger Lakes Donor Recovery Chevrolet stalled entering the Esses during the third caution on Lap 36. He was pushed behind the wall as J.J. Yeley, another top-five finisher from Road America also wrecked by Bayne, walked away from a destroyed #28 Texas 28 Spirits Stage Dodge fielded by JGL Racing. *This is the first last-place finish for both Wise and the #46 in a Nationwide Series race at Watkins Glen. Johnny Sauter picked up the 2nd last-place finish of his NASCAR Sprint Cup Series career in Sunday’s GoBowling.com 400 at the Pocono Raceway when his #93 Dr. Pepper Toyota fell out with electrical problems after he completed 11 of the race’s 160 laps. The finish was Sauter’s first of the 2014 season and his first in a Cup Series race since May 16, 2010, when his race at Dover in Tommy Baldwin’s unsponsored #36 ended with electrical problems after 29 laps. Since that Dover race, Sauter had made just four Cup Series starts before he was tabbed to drive the “start-and-park” #93 entry at Pocono. The preliminary entry list had Mike Bliss in the #93, as he had piloted the car in both its starts this season at Kentucky and Loudon. However, on Friday, it was announced that Sauter would drive the car while Bliss would race for TriStar Motorsports in the Nationwide Series race at Iowa. 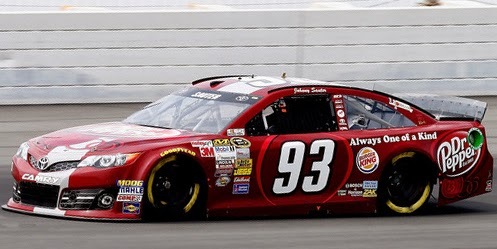 BK’s #93 kept Sunday’s field at 43 cars, and with no drivers going home after qualifying, Sauter was guaranteed his first Pocono start in the Cup Series since his 36th-place run driving HAAS-CNC Racing’s #70 (now Stewart-Haas Racing’s #14) on August 5, 2007. Sauter was slowest in the opening practice session, having turned just one lap at an average speed of 165.896 mph. He improved to 166.162 mph in qualifying, but still remained the slowest car in the field, guaranteeing him the 43rd starting spot. Kyle Larson, who earned his first career pole that day, timed in at 183.438 mph. Sauter was the only driver to not participate in either of Saturday’s practices, and the team prepared for its short run on Sunday. On Lap 10, Sauter was running 4 seconds behind the next car when the caution flew for the first time for Jimmie Johnson. Johnson, who twice narrowly averted his first last-place finish in the previous three races, had made contact with the outside wall and cut down a left-rear tire. Sauter stayed on the track during the caution while Johnson lost a lap and briefly fell to 43rd. But on the restart, Sauter pulled off the track, and secured his last-place finish. Johnson clawed his way up to 4th spot on Lap 111 when yet another cut tire ended his day with a hard crash in the tunnel turn. Between Sauter and Johnson in the Bottom Five were three drivers who were all involved in incidents during the first 52 laps. 42nd-place Kyle Busch lost the engine on his #18 M&M’s Toyota on Lap 24, leaving him with his worst finish since Dover. Landon Cassill ended up 41st when his #40 Newtown Building Supplies Chevrolet slammed the Turn 2 wall on Lap 30. 40th-place Joe Nemechek, making his first Cup start since Kentucky, crossed paths with Kasey Kahne coming off Turn 3 on Lap 52. Nemechek fought to maintain control, but made hard contact with the frontstretch wall. Frustrated with Kahne, who complained on the radio that Nemechek should have been parked, Nemechek returned to the track 34 laps down by Lap 85. He remained on track until Lap 132, when his Land Castle Title Toyota trailed smoke on the Long Pond stretch, ending his afternoon. There was so much attrition in Sunday’s race that all of the thirteen drivers involved in the day’s biggest accident on Lap 118 finished outside the Bottom Five. Dave Blaney, still the 2014 LASTCAR Cup Series leader, made his first Cup start since trailing the field in the June Pocono race. Driving the #37 Tommy Baldwin Racing entry which debuted with Bobby Labonte last week at Indianapolis, Blaney came home 26th, two laps down. *This is the first last-place finish for the #93 in a Cup Series race at Pocono. It is the first for BK Racing at Pocono since June 10, 2012, when Landon Cassill’s #83 Burger King Real Fruit Smoothies Toyota crashed after 1 lap. Matt Frahm picked up the 2nd last-place finish of his NASCAR Nationwide Series career in Saturday’s U.S. Cellular 250 at the Iowa Speedway when his unsponsored #46 The Motorsports Group Chevrolet fell out with ignition trouble after he completed 3 of the race’s 250 laps. The finish was Frahm’s first of the 2014 season and his first in the series since November 12, 2011, 88 races ago, when he was involved in an opening-lap crash at Phoenix. Frahm, a 24-year-old driver from North Salem, New Hampshire, was making just his eighth start since the 2011 Phoenix race and his second of the 2014 season. In his most recent start at Loudon, driving the #44 TriStar Motorsports entry, Frahm matched his career-best 25th-place finish at Lucas Oil Raceway in 2011, when he drove Go Green Racing’s #39. At Iowa, Frahm would reunite with The Motorsports Group, who fielded a car for him in his only other Iowa start in 2012, finishing 38th in the #42. This time, he would drive the #46 which had already finished last three times this season with Ryan Ellis and Matt DiBenedetto. Frahm’s team was originally one of just 38 cars on the preliminary entry list, but two last-minute entries brought the field up to a full 40 starters. On July 28, Mike Harmon entered his #74 30 Days Foundation Dodge. Then on August 1, James Carter’s #72 team joined as a post-entry for the second-consecutive week, this time with Scottish driver John Jackson behind the wheel. While Iowa would be Harmon’s first start since Chicago, two races ago, it would be Jackson’s first Nationwide race since May 20, 2012, also at Iowa. Frahm, Harmon, and Jackson all ended up in Saturday’s Bottom Five. Frahm didn’t participate in the opening practice session, then ranked 37th of 38 in Happy Hour, besting Jackson. He qualified 39th, ahead of Harmon, with a lap of 125.794 mph. Frahm exited after three laps, followed two circuits later by Harmon. Current 2014 LASTCAR leader Blake Koch exited after thirteen laps, once again carrying sponsorship from M&W Logistics Group, Inc. on TriStar’s #10. Jackson left the race ten laps after Koch, followed seven laps later by Morgan Shepherd, making his first Nationwide start since Dover, eight races ago. *The #46 The Motorsports Group team has swept both last-place finishes at Iowa in 2014. Both were listed with ignition trouble as the cause. The team has finished last in half of the last six races at the track, including Chase Miller’s run in the spring of 2012. Justin Jennings picked up the 2nd last-place finish of his NASCAR Camping World Truck Series career in Saturday’s Pocono Mountains 150 at the Pocono Raceway when his #63 Randco / Young’s Building Systems Chevrolet fell out with a vibration after he completed 2 of the race’s 64 laps. The finish was Jennings’ second of the 2014 season and his first since Gateway, four races ago. At the halfway point of the season, he is now tied with Ryan Ellis for the lead in the 2014 LASTCAR Truck Series Championship. For the second time this year, Jennings did not run a full-race entry fielded by Mike Mittler, but instead a “start-and-park” #63 truck fielded by Randy Young to help fund Young’s primary #02 driven by Tyler Young. In his previous start for Young at Texas, Jennings came home 26th of 27 starters in a Chevrolet driven earlier that year by Charles Lewandoski. Two races ago at Iowa, Jennings scored a season-best 15th-place finish. But for Pocono, the objective was different. Jennings was 28th-fastest of 30 in the opening practice session and did not participate in Happy Hour. He qualified 31st for Saturday’s race at an average speed of 152.418 mph, one spot ahead of Caleb Roark in Jennifer Jo Cobb’s #0. Roark was behind the wheel of the #0 after current LASTCAR leader Ryan Ellis returned to Jim Rosenblum’s #28, a team absent since their accident at Charlotte in May. Ellis finished 19th. In the race itself, Jennings pulled behind the wall one lap ahead of Roark. 30th-place B.J. McLeod, who relieved an injured John Wes Townley in Friday’s ARCA race, fell out nine laps later in Bobby Dotter’s #07 Thunder Exhaust / American Tactical / JD Squared Chevrolet. T.J. Bell finished 29th, his #50 Fallen Linemen Organization Chevrolet out with transmission problems after 13 laps. Rounding out the Bottom Five was Ray Black, Jr., McLeod’s teammate in the #08 ScubaLife / NASE Worldwide Chevrolet, taken out in a single-truck accident that brought out the first caution of the afternoon. Tyler Young, Jennings’ part-time teammate, ran a solid race until a controversial accident between Tyler Reddick and German Quiroga took him out just two laps from the finish. Young ended up 26th, retired with crash damage. Reddick, retaliating after an earlier tangle with Quiroga, was parked for aggressive driving. *This is the first last-place finish for both Jennings and the #63 in a Truck Series race at Pocono.